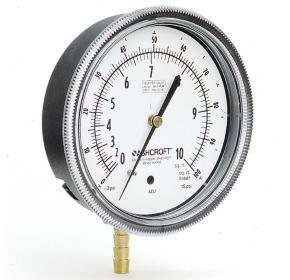 The Ashcroft® 1495 diaphragm receiver gauge is an economical solution for pneumatic receiver gauges. This model provides reliability and performance due to its ultra-sensitive system. An ideal product for pneumatic receive systems. Very sensitive to small pressure changes. Dial size: 2-1/2" and 3-1/2"
The 1495 receiver pressure gauge is an excellent choice for pneumatic receiver gauge applications. The diaphragm sensor provides smoother pointer travel than a Bourdon tube in small diameter receiver gauges.